EU Organic Rice Protein - Made in the EU - Vegan Protein - 1kg. Erdschwalbe EU organic rice protein / Made in the EU / 1 kg bag. Ingredients: 100% rice protein powder from controlled ecological. Agriculture. - Main reference countries Raw materials: Spain, France, Italy, Portugal, Thailand, South America. Each purchase of the best available quality (lowest values for heavy metals, pesticides, etc.). That's not always the EU! Exclusive use of tested raw materials in optimal quality. Product is also used for BABY food. - 81% vegetable, vegan high calcium protein. - Contains all eight essential amino acids. The amino acid profile is more than 98 percent similar to that of human breast milk. - The values of the three branched-chain amino acids (BCAA) that are so important for muscle growth are particularly high in the rice protein. In the case of isoleucine and valine they are even higher than in the conventional whey proteins, while the leucine content of the rice protein is only slightly lower. Especially this rice protein typical amino acid profile is therefore much more in line with the needs of the human body. - Erdschwalbe EU Organic Rice Protein can be used to produce food, shakes and smoothies. As an essential ingredient in human nutrition, they help to maintain and increase muscle mass, among other things. In addition, rice protein as a source of calcium serves to maintain bone health and is particularly well tolerated and especially suitable for allergy sufferers. 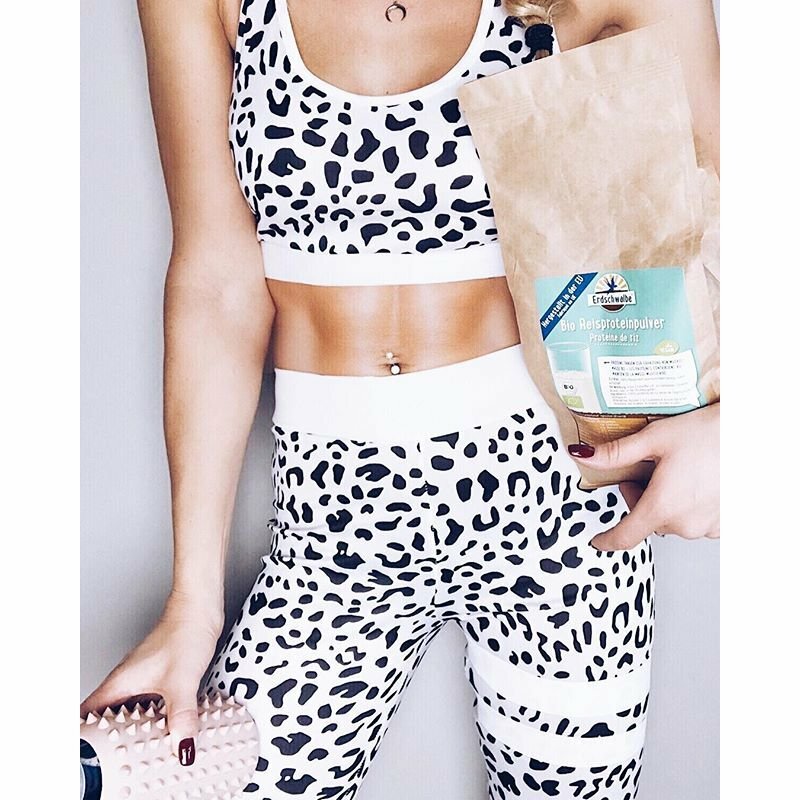 - A special feature of the rice protein, in addition to the balanced proportion of amino acid is the high content of tryptophan, a precursor of the happiness hormone serotonin. 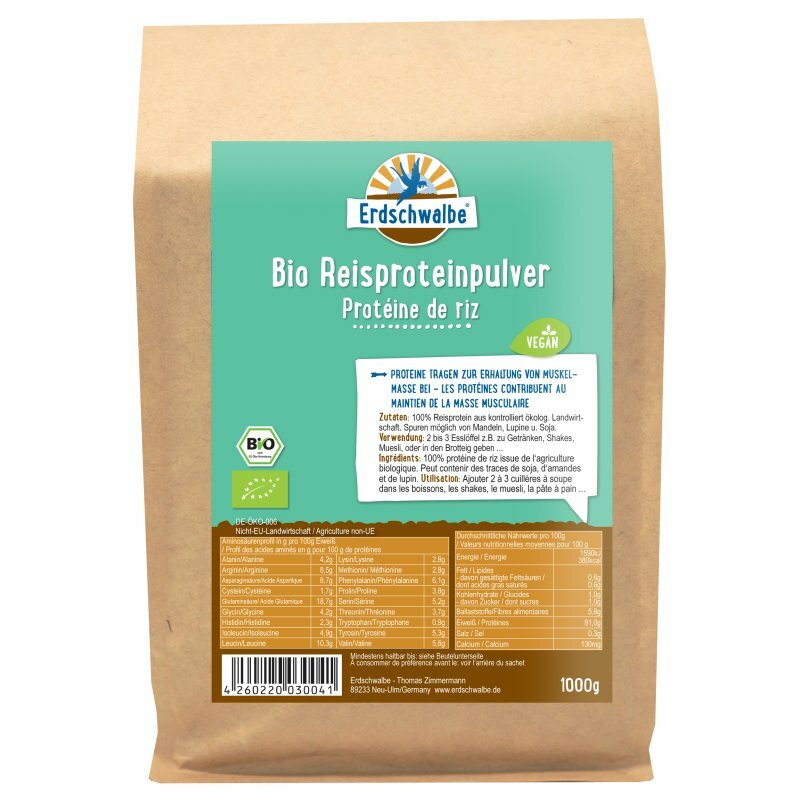 Erdschwalbe EU Organic Rice Protein is slightly soluble and well tolerated. Use: 1 to 2 tablespoons, e.g. to give drinks (juices), shakes or cereals. Store cool and dry.